For ice cream, where else but Handel's Home Ice Cream and Yogurt would you see a long line in the dark in the blustery and cold wind at 9:00 P.M.? Where is THE place to get ice cream in Redondo Beach? It's Handel's, the ice cream parlor that has been around since 1945! As we said, the lines are absolutely nuts here even in the wintertime, and they're even longer during the dog days of summer when the sun is blaring down. It just goes to show that ice cream is truly for any weather, any time. What even makes Handel's special, though? Is it the only ice cream place within a 10 mile radius? No, absolutely not--there are a bunch. The thing is, Handel's excels in a lot of different areas. Firstly, it's cheap! You can get a scoop for $2.50 flat on Tuesdays, and $3.50 every other day. This leads us to our second point: the scoops are huge! 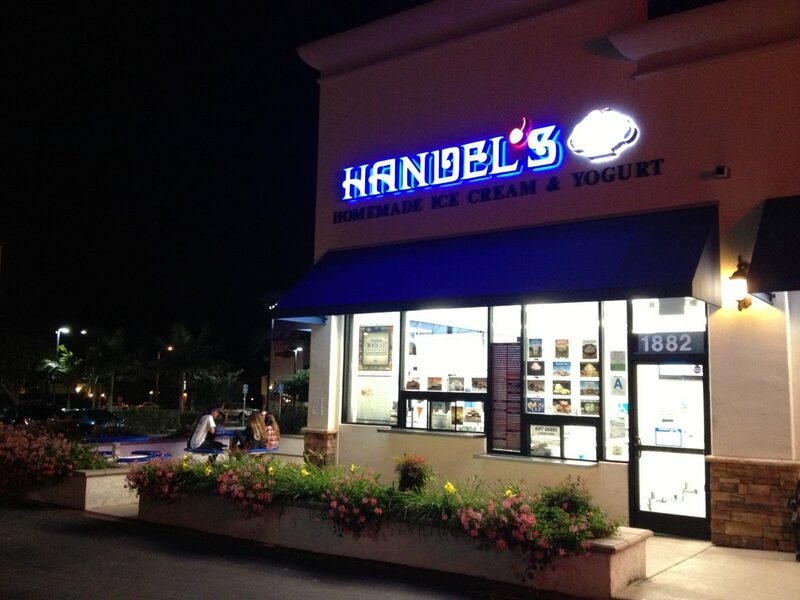 If you compare Handel's to your average ice cream spot, you'll notice that Handel's is approximately 1.75 to 2 scoops to the other place's 1 scoop. We did the math (disclaimer: we did no math). Third, Handel's has absolutely awesome and unique flavors. Our favorite is Graham Central Station, which has graham crackers and some chocolate inside. There's also awesome flavors like chocolate malt with caramel and Samoa Girl Scout cookies--seriously, it's incredible. The best part is that they hand-make and mix the ice cream every single morning. The freshness really comes through; the ice cream is super rich, and you can tell they use some pretty real ingredients (the Snix flavor, for instance, definitely has tons of Snickers in it. Be warned; it's really sweet!). As Handel's official website says, "Handel's Homemade Ice Cream & Yogurt is made fresh daily, one batch at a time, at each location, using products, equipment, methods and recipes exclusive only to Handel's. WE NEVER SKIMP! Fistfuls of nuts, creamy caramel, deep dark chocolate, fresh fruits, and fluffy marshmallows are blended into each batch as it is drawn from specially designed machines." Some other aspects we really wanna highlight is the fact that Handel's is housed in a little shopping center where probably the next most recognizable thing is CVS. It's a pretty quiet area and definitely has a humongous and free parking lot. There are also some picnic tables around--only a few, so gotta be lucky to get 'em--to sit on as well as some flower bedding shelving to sit on. It's pretty chill, so you can totally just eat your ice cream standing around or just camp out in your car and listen to some music. We also want to highlight the ice cream cashiers and scoopers here. They're pretty young and always seem to have a good attitude; that's part of the charm of Handel's for sure. We're always big proponents of fabulous service. 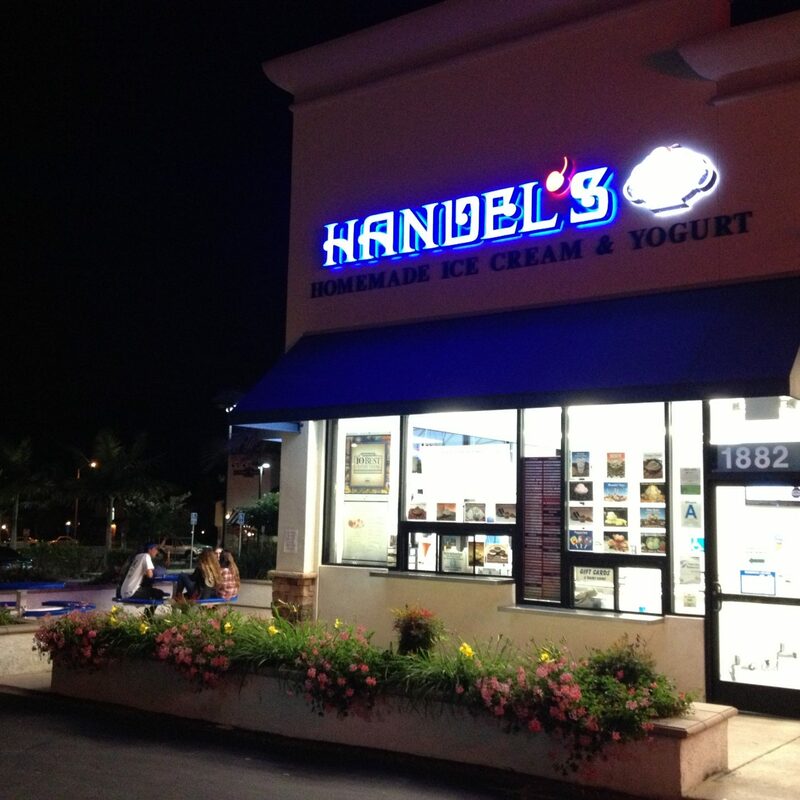 If you want some delicious ice cream in a nice and chill environment in Redondo Beach, Handel's is for sure the place for you.